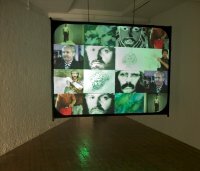 Known as an art critic and writer, Lynn MacRitchie also has a long-established practice as an artist, beginning in the 1970s and including work in video, performance, photography and installation. 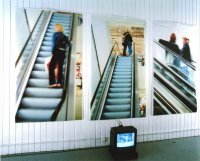 She showed an early commitment to radical and progressive art when, in 1973, as a student of Fine Art, she organised both the Three Day Event (Art and Society) and the Participation Art Event at Edinburgh College of Art, inviting David Medalla, John Dugger, Steven Willats, Marc Chaimowicz, the Artists Placement Group and others to present work at the college. On moving to London in 1974, she became a founder member of the Poster Film Collective and Artists for Democracy, taking part in the Arts Festival for Democracy in Chile held at the Royal College of Art that October. Her video tapes of the festival are a remarkable record of an event now recognised as of historic importance. Digitally remastered, they were shown in the exhibition Artists for Democracy, The Archive of Cecilia Vicuña, in the Museum of Memory and Human Rights, Santiago, Chile, 2014, where they now form part of the permanent collection. As a writer, she was one of the first contributors to Performance Magazine and other innovative journals such as New Dance before moving into mainstream journalism with the Financial Times, for which she wrote about contemporary art for fifteen years (1991-2016). She returned to art making in the late 1990s and has since exhibited regularly in the UK and abroad. Her interest in video, performance and installation continues, and her most recent works are short films in which performance, location and sound – including specially composed music and lyrics – are brought together to powerful and thought-provoking effect. 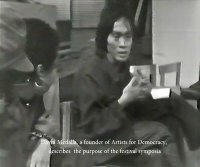 Still from film of the Arts Festival for Democracy in Chile at the RCA in 1974.